The state of the writer matches the state of the stream, but the writer cannot control all the transitions between the stream states. When the host links the writer and reader, the writer transitions from the Unlinked state to the Disabled state. When the host disables the stream, the writer transitions to the Disabled state immediately. When the writer or host initiates a flush and disable command, the writer transitions to the Flushing state and then to the Disabled state when the transfer of data in the queue is complete or the command times out, whichever happens first. 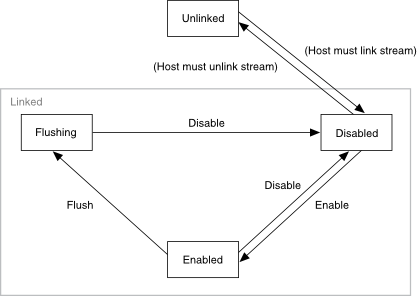 Use the Flush and Disable Stream and Disable Stream nodes to disable the stream from the host application. The following illustration shows the possible states of the writer and the transitions that the writer can control.